Bolivia’s nuclear dream: What is at stake? Evo Morales’s plans to develop a nuclear energy programme in Bolivia have sparked debates in the country around issues of citizen participation and socio-ecological justice. Bolivia’s government has publicly announced plans to develop a nuclear energy programme for peaceful purposes, such as electricity networks, agriculture, medicine and research. From 2015 to 2025 infrastructure shall be developed mainly in the department La Paz, with investments of $2 billion US Dollars. In September 2014, the presence of uranium deposits has been confirmed in the northeast of the departmento (region) of Santa Cruz. These add to other known deposits in Potosí and Tarija, according to earlier reports. The International Atomic Energy Agency officially visited Bolivia and confirmed their support. Potential bilateral partners currently include Russia, Iran, Argentina and France, illustrating the potential to create a new energy geopolitics. (Political) power is the main argument put forward by the Bolivian government for implementing this plan. 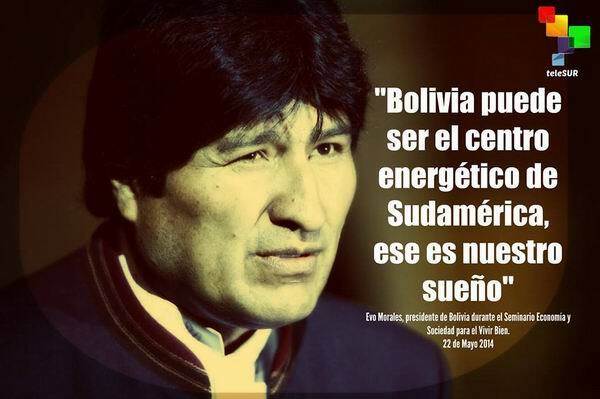 In president Evo Morales’s opinion, countries that control their energy sectors have more power than those who have money or missiles. According to the proposal, Bolivia’s nuclear energy programme shall first feed the internal market, and only then the external. Morales argues that this is a step—and the best way—towards liberation from technological dependence. Official declarations argue that nuclear energy cannot be stigmatised due to the experiences in Chernobyl and Fukushima. Furthermore, nuclear energy is believed to be a clean energy source. Morales informed the public after several years of planning, which – according to him – applauded the initiative. On the other side, a group of international anti-nuclear activists has written an open letter to president Morales expressing their concerns. Different groups in society have started to generate debates, in order to inform the population about the risks and problems related to the plan, alongside the benefits highlighted by the government. Mainly, they demand the participation of society in this decision; some ask for a referendum. Critics argue that Bolivia is currently producing enough electricity for national supply. They also raise doubts regarding whether Bolivia has enough uranium deposits for the programme and stress that Bolivia’s nuclear programme is unconstitutional. Just recently, from 2006 to 2008, a Constitutional Assembly took place in Bolivia through a highly participatory process with 255 directly elected members. The new Constitution—which was approved in 2009 via referendum—is globally groundbreaking on several counts. These include: designing of intercultural democracy and decolonisation, as proposed by the country’s indigenous majority; centrality given to socio-ecological dimensions and the role of the Mother Earth; and the recognition of basic social rights. Moreover, article 344 of the Constitution prohibits the storage, transit and deposit of nuclear and toxic waste. The question is not whether Bolivia has the right to develop a nuclear energy programme just as other countries have done and still do. Trying to preserve an “island” where the world works differently, as long as we do not have to change our energy and consumption patterns, would be quite neo-colonial indeed. Rather, the question is whether Bolivia is willing to leave the globally groundbreaking path towards more democracy and socio-ecological justice as proposed by the indigenous majority. And this is not the exclusive responsibility of Bolivia’s poor (and “rich”), but also depends on the international community’s commitment to supporting such a challenge. * Isabella M. Radhuber is a Post-Doc fellow and a member of the research group “International Political Ecology” at the University of Vienna. She has lived in Bolivia the past seven years and published several media and journal articles on natural resource politics and democratization in Bolivia and Ecuador. Her latest book is Recursos naturales y finanzas públicas. La base material del Estado plurinacional de Bolivia (Plural, La Paz). I will be very disappointed to see Bolivia take this path. The alternative energy possibilities are there for them; solar, wind, water, etc. The poorer nations have an opportunity to become leaders to the over-developed nations.